I first made these wontons a couple of years back for a little happy hour I threw for friends from work. I remember enlisting the help of my good friend Steve to be my sous chef to make sure everything was ready and done on time. 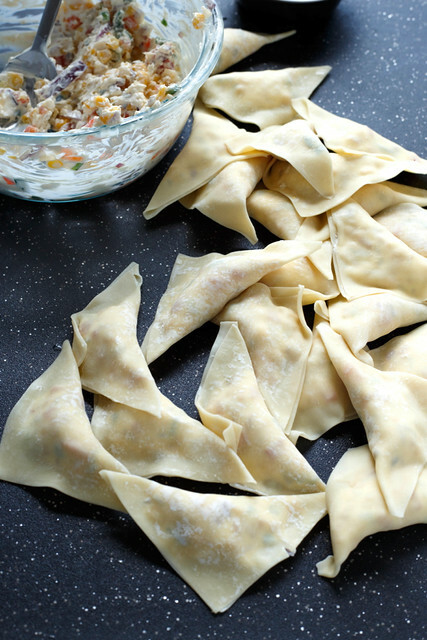 The first task he tackled was filling and wrapping the wontons. We both had never done it before but he decided, very stereotypically, that since he’s Asian, that skill must have been inherently imbedded somewhere in his DNA. Steve was totally right. He filled and wrapped the first wonton with careful approach. After that, he was like a wonton savant. We both had no idea how he was prepping them so fast. 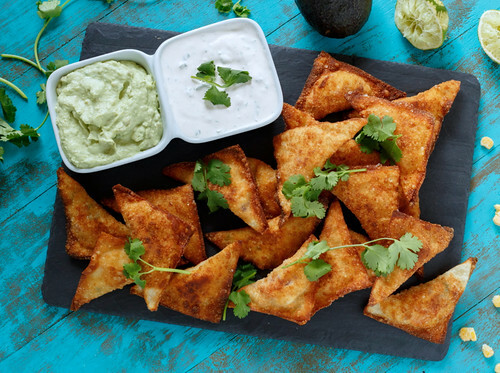 We laughed and laughed about this new-found career opportunity… that is, until he realized that now every time I make these southwest wontons, he’s in charge of filling and wrapping them. 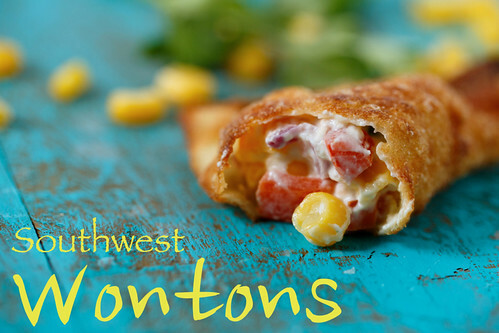 Anyway, I think you will really love these Southwest Wontons. 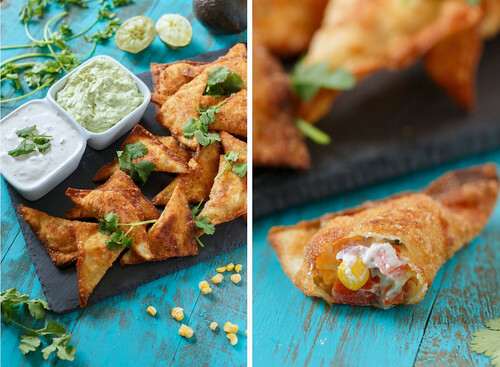 They are an insanely addictive party snack and after making them for your next friendly get-together, will definitely up your “cooking street cred”. Frozen corn will do the trick just fine. You can use fresh corn if you’ve got it, but here in New York it’s just not that time of year yet. That is, of course, unless you’re extremely clever like my friend Sandra from Kitchen Apparel and stash away last summer’s bounty of fresh corn in the freezer for year round use. I’m totally doing that this year! And really, if you have the moment, check out her really great blog. Most supermarkets by me sell these fresh wonton wrappers nowadays. I usually find them, oddly enough, next to the pre-packaged salad mixes. I’m not quite sure why, but who am I to question such product placements. Just look for them in one of the refrigerated sections of your supermarket. Assembling these little buggers are quite easy albeit a bit of a repetitive, tedious task. I enjoy it though, and the rewards are well worth it. Now, listen, I know you. 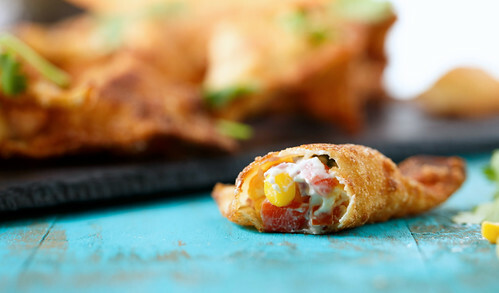 You’re going to want to stuff your wontons way too full. That’s like me trying to get myself into a pair of skinny jeans. It’s just not happening. Err on the side of under-stuffing. Dip your index finger in a little bowl of water and trace the perimeter of your wonton. Fold it over into a triangle and make sure there’s a good seal. You’d hate to have a wonton leakage accident as they are frying up. And then repeat. Again. And again. And again. And eventually, once all your filling it used up, you’ll have a glorious sight before you of 30-35 wontons waiting to be fried to crispy, golden brown perfection. You’ve got two dipping options here. One’s a bit healthier than the other, if you are concerned about that sort of thing. Each are really good and I definitely prefer to have both. When I get bored with one, just switch it on up! But if you only had time to make one and are forcing me to choose, I’d go with the Lime Crema. 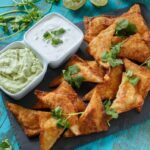 It’s so simple yet so awesome with the wontons: Sour cream is spiked with the zest and juice of a lime, a generous dash of hot sauce, and some herbaceous cilantro. I digress. 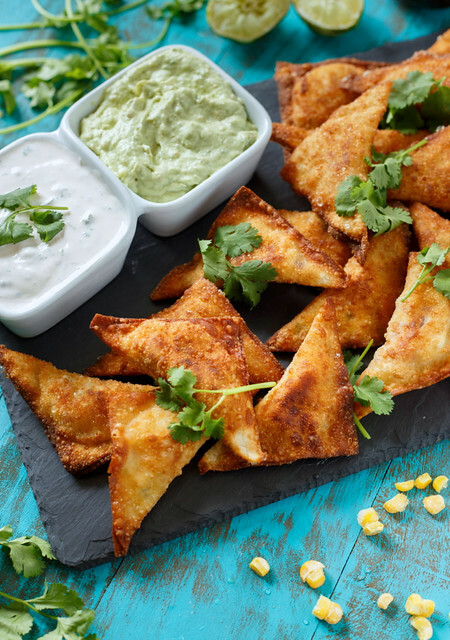 To fry up these wontons, just pour a bit of canola or vegetable oil into a fry pan or skillet. You need just enough to submerge half of the wonton, so probably about 1/2″. 30-45 seconds per side should do it. They of course taste best right out of the fryer. The wonton is nice and crispy, the inside steamy and creamy. But I’ve also made them a little bit ahead of time before my guests arrive. All I do then is pop them into the oven to reheat up a bit in a single layer on a baking sheet. You lose a little tiny bit of the crunch factor, but no one seems to mind. I know I say I love a lot of food (that was a lot of “i”s in that sentence, sorry). And it’s the truth. But I really, really love these wontons. A lot. *can typically be found in produce refrigerated section of supermarkets by the tofu products. 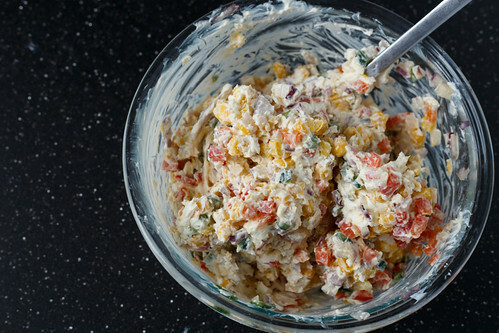 In a medium mixing bowl, combine the corn, red bell pepper, poblano chile, red onion, and cream cheese. This is easier to do if the cream cheese is softened, so remove from it from refrigerator about an hour prior to mixing. Not required, but definitely makes the job a bit easier. Season mixture with Kosher salt and freshly ground black pepper. Fill a small bowl with water. 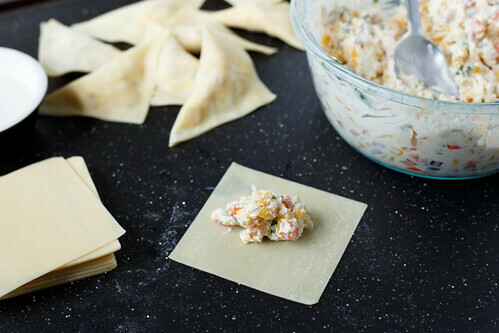 Working one at a time, add a spoonful of the cream cheese mixture into the center of the wonton. Be careful not to overfill or else you won’t be able to seal it. Dip your index finger into the water and trace the perimeter of the wonton wrapper. 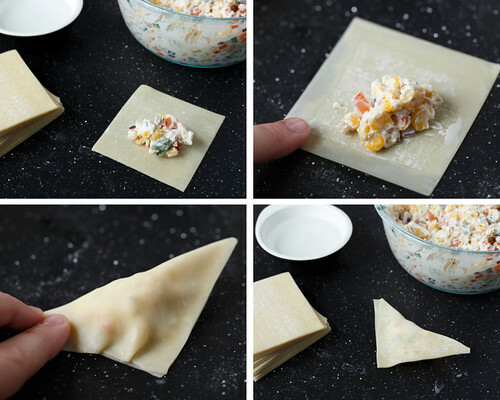 Fold over the wonton to form a triangle and seal the edges completely. Make sure they are completely sealed to avoid the wonton from leaking while frying! Repeat with remaining wontons until all the mixture is gone. Add enough oil to a fry pan or skillet in order to submerge half of each wonton (about 1/2″ of oil should do it). Heat over medium heat until bubbles form around a toothpick inserted into the oil. Cooking in batches (single layer, try to not let wontons touch), fry wontons until both sides are golden brown, about 1 minute per side. Wontons should sizzle when they are first placed into the pan. You may have to lower the heat a tiny bit as you go if oil begins to over heat. Remove fried wontons to a paper towel-lined baking sheet or plate to drain excess oil. Serve immediately. You can make them a little bit ahead of time if needed (I’ve made these an hour before guests arrive), in which case reheat in a single layer in oven to crisp up the wontons and heat through. 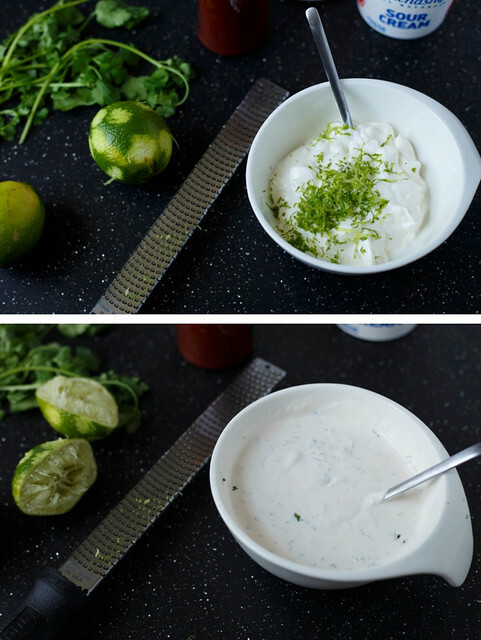 Combine in a small mixing bowl the sour cream, zest and juice of the lime, cilantro, and a few dashes of hot sauce (to taste). I like mine with a little spicy kick. 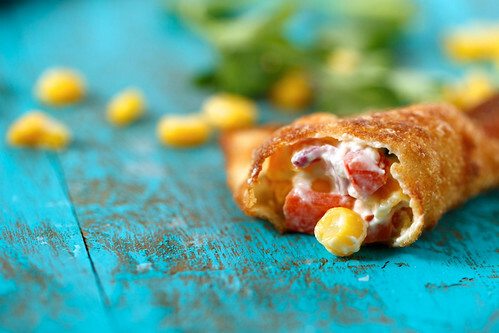 Can be made a day ahead, covered, and refrigerated until ready to serve. Combine the mashed avocado, plain greek yogurt, zest and juice of a lime, and garlic clove in a food processor or blender until smooth. If the mixture is a bit too stiff, add a splash of water to thin it out a bit. Season with Kosher salt and freshly ground black pepper. Refrigerate for at least one hour to allow flavors to meld. In order to avoid browning, cover the mixture directly with plastic wrap, sealing off all outside air. Can be made a day ahead of time. I can totally see why you are playing favorites! Don’t worry I won’t tell 🙂 And that Avocado Lime Cream sounds like something I would put on EVERYTHING…or just eat it for breakfast (I must be hungry). Thanks for the shout out Chris. I’m going to turn you into a corn hoarder too!!! I am ready to learn your corn hoarding ways. It is a MUST this summer! These look too good to have around the house – I wouldn’t be able to stop at 1, or 10! I’m the same way! 1 is never an option… hahaha. 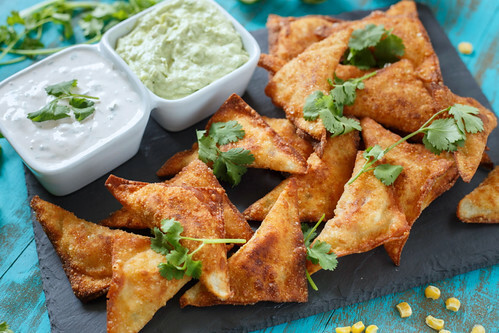 These wontons look amazing! Thanks for sharing – can’t wait to try! My husband, teenage daughter and I crave wontons. We order them at every opportunity we can. When I saw the photo for these beauties on Pinterest, I knew I had to make them. We three just polished off 18! These are DIVINE. Cannot wait to make them again.